The Kenya people are made up of 3 primary groups i.e. the Bantu, Nilotic and Cushitic. These indigenous groups make up 99 percent of the population and the remaining 1 percent consists of non-African groups (Arab, European and Asian). Kenya’s population growth is one of the highest in the world. According to a report on CIA World Factbook, the Kenya people totaled 41.7 million in July 2011. Going by the current trend it is expected that by 2030, Kenya’s population will grow to about 65.9 million. They have been drifting to Kenya since 500 BC from West Africa. They are made up of the Kikuyu, Meru, Gusii, Embu, Akamba, Luyha and Mijikenda. They live mainly in the coastal, central and western regions of the country. The Kikuyu are the largest ethnic group and are prolific farmers, inhabiting the central highlands. Jomo Kenyatta, the first president of Kenya, provides a detailed insider description of the Kikuyu covering virtually every aspects of tribal life in his book Facing Mount Kenya. They migrated from Sudan and Egypt and are made up of the Masai, Turkana, Samburu, Luo and Kalenjin. They are traditionally pastoralists and fishermen and reside in Kenya’s broad Rift-Valley region and around Lake Victoria. The Masai are world-famous and have come to be an international symbol of the African tribal life. They are pastoralists and have managed to retain most of their traditional way of life. African Warriors: The Samburu by Thomasin Magor is a striking photo-essay detailing the folkways of the Samburu people of Kenya. They migrated from Somalia and Ethiopia and reside in the arid and semi-arid eastern and northeastern parts of the country. 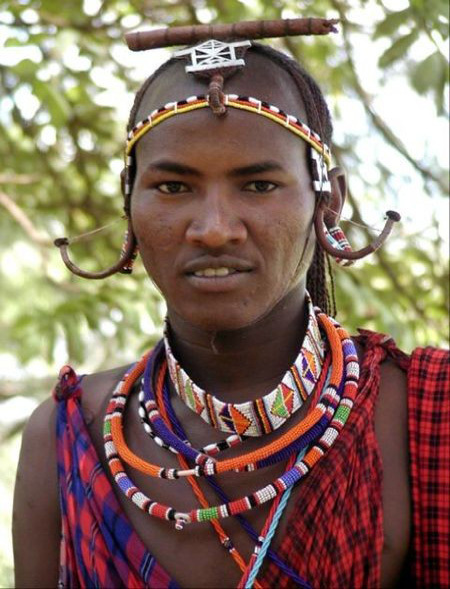 Some of the Cushitic people of Kenya include the Somali, Rendile, Borana, Oromo and El Molo. The Somali are the well known and keep large herds of camels, sheep, goats and cattle. They move from place to place in search of water and pasture. They maintain close ties with their kinsmen in the neighboring countries of Somalia and Ethiopia. 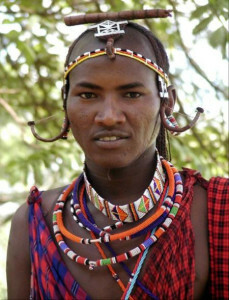 The El Molo are the smallest ethnic group in Kenya. They are hunter-gathers and although not as colorful as other tribes, they adorn themselves with earrings, beads and bracelets. The non-African groups are the Arab, Asian and European. The Arab (Swahili) are the result of Bantu – Arab intermarriage. They reside along the coast and descend from Omani, Yemeni and Persian traders of the pre-colonial period. The Swahili language, a mixture of Bantu and Arabic developed as a lingua franca for trade. The Asian community comes from the laborers brought to build the Kenya-Uganda railway line. Many stayed after the railway line was completed, as did most of the small businessmen and Indian traders. Most of the Europeans are of British origin, many of whom opted to become Kenyan citizens after Kenya got its independence in 1963. The following numbers represent the ethnic composition of Kenya’s population as compiled in the 2009 census.